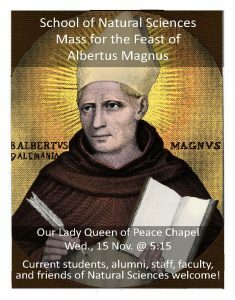 Please remember to join the School of Natural Sciences tomorrow for the Mass for the Feast of Albertus Magnus. See you at Our Lady Queen of Peace Chapel at 5:15 PM! Students, alumni, staff, faculty, and friends of the School of Natural Sciences are welcome!